Background: Self-reported physical activity has been inversely associated with mortality but the effect of objectively measured step activity on mortality has never been evaluated. The objective is to determine the prospective association of daily step activity on mortality among free-living adults. Methods and Findings: Cohort study of free-living adults residing in Tasmania, Australia between 2000 and 2005 who participated in one of three cohort studies (n�=�2 576 total participants). Daily step activity by pedometer at baseline at a mean of 58.8 years of age, and for a subset, repeated monitoring was available 3.7 (SD 1.3) years later (n�=�1 679). All-cause mortality (n�=�219 deaths) was ascertained by record-linkage to the Australian National Death Index; 90% of participants were followed-up over ten years, until June 2011. 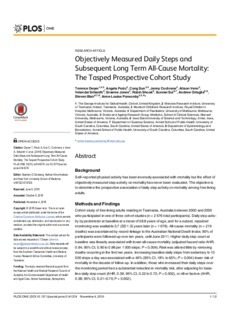 Higher daily step count at baseline was linearly associated with lower all-cause mortality (adjusted hazard ratio AHR, 0.94; 95% CI, 0.90 to 0.98 per 1 000 steps; P�=�0.004). Risk was altered little by removing deaths occurring in the first two years. Increasing baseline daily steps from sedentary to 10 000 steps a day was associated with a 46% (95% CI, 18% to 65%; P�=�0.004) lower risk of mortality in the decade of follow-up. In addition, those who increased their daily steps over the monitoring period had a substantial reduction in mortality risk, after adjusting for baseline daily step count (AHR, 0.39; 95% CI, 0.22 to 0.72; P�=�0.002), or other factors (AHR, 0.38; 95% CI, 0.21-0.70; P�=�0.002). Conclusions: Higher daily step count was linearly associated with subsequent long term mortality among free living adults. These data are the first to quantify mortality reductions using an objective measure of physical activity in a free living population. They strongly underscore the importance of physical inactivity as a major public health problem.